Habit: Plant 1--4.5 dm, glabrous or minutely scabrous, glaucous; taproot slender, scabrous. Stem: 0. 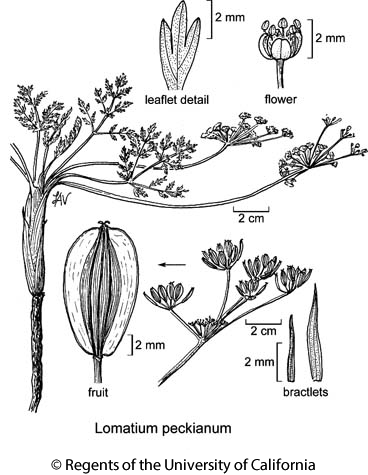 Leaf: petiole < 5 cm, generally scarious-sheathing throughout, straw-colored; blade 5--10 cm wide, obovate, ternately or ternate-pinnately dissected, segments 1--15 mm, linear to oblong, +- acute. Inflorescence: peduncle 1.2--4 dm, spreading; bractlets generally 5--10, 2--7 mm, linear, +- scarious; rays generally 8--12, 1--6.5 cm, spreading; pedicels 3--6 mm. Flower: corolla cream to lemon-yellow. Fruit: 8--14 mm, oblong-elliptic to elliptic, glabrous; wings < body in width; oil tubes several per rib-interval, obscure. Chromosomes: 2n=22. Ecology: Volcanics, pine/oak woodland; Elevation: 800--1800 m. Bioregional Distribution: KR (Siskiyou Co.); Distribution Outside California: southern Oregon. Flowering Time: May Note: Locally abundant. Citation for this treatment: Lincoln Constance & Margriet Wetherwax 2017, Lomatium peckianum, in Jepson Flora Project (eds.) Jepson eFlora, Revision 5, http://ucjeps.berkeley.edu/eflora/eflora_display.php?tid=31448, accessed on April 20, 2019. KR (Siskiyou Co.); Markers link to CCH specimen records. Yellow markers indicate records that may provide evidence for eFlora range revision or may have georeferencing or identification issues. Purple markers indicate specimens collected from a garden, greenhouse, or other non-wild location.